Beauty and the Gamer: April's Love It or Leave It. Hi Everyone! It's that time again! Am I lovin' it or leaving' it? I'm absolutely LOVING IT!!! I have three items that I couldn't do without this month. Sephora's Precision Pore Cleansing Pad. It's this pink little skin cleaning delight! Now, i've owned the Clarisonic and it did nothing but damage to my skin. Yes, I had the sensitive brush. Let's just say that I'm VERY thankful for Sephora's awesome return policy. But this little guy was so pink and so cheap, that I didn't mind if things didn't work out between us. Oh LA! Things have been going strong for a month, now and I can really see a great future for us. LOVE LOVE LOVE LOVE LOVE LOVE LOVE IT! I think that my husband might love it too because I think that he's been using it (his skin has been looking awfully nice lately!). All that I can say is that it's really helped clear up my skin and just overall, it seems less dull and feels smoother! The Body Shop's Lychee Blossom Eau de Toilette. I picked this one up because it smelled okay in the store and I needed an item to bring my total up to $40 so I could receive $15 off my purchase. I remember when The Body Shop's "White Musk" was all the rage in my poor University days. So I was pleasantly surprised that I really liked this perfume. I think that it's a special edition or a seasonal fragrance, but don't quote me on that. It has the right mix sweet fruity scents and a light floral scent. Third and last item is.....Bed Head's "After Party". This is a smoothing cream for silky, shiny, healthy looking hair. It's AAAAWWWWEEEESSSOOOMMMMEEEEE!!!! I've tried sooooo many smoothing drops/creams/hair crack that I don't even care to mention. This by far is definitely THE one. I have long slightly wavy hair. Yes, being asian, I'm expected to have stick straight hair, but unfortunately, my hair has a slight curl to it. This stuff totally smooths my hair it out. I straightens it like nobody's business (and it's really light!)! It also smells fantastic to boot! For such a picky person, these products definitely came out to impress! I'm just sad that the Lychee Blossom is a special limited edition perfume because I wouldn't mind having an extra one on hand for the in between perfume times. 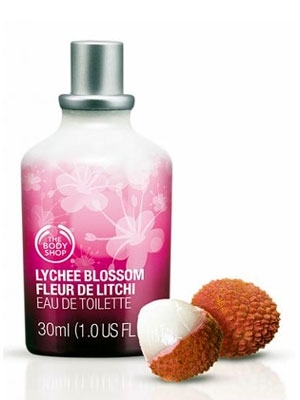 I love Lychee's - might have to give that a sniff when I'm in the body shop next. I haven't used the Bed Head After Party in yearrrrs but i remember loving it! I love Lychee's too...but this stuff smells so good!!!!! I just discovered After Party - I'm wondering where it's been all my life! LOL! Haha, I have the little pink scrubbie too and my fiance just confessed to me that he's been using it too! tell me more about the pore cleansing pad- how exactly do you use it ? thanks so much, I am going to get one! When I'm visiting the US later this year I;m defo going to pick up one of those cleansing pads - sounds great! 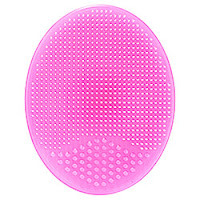 That pink scrubby looks really good I've been wanting to find something that would give my skin a little extra pick me up! After party is an awesome product too I used to use it all the time it smells so goodddd! It is...and you know what....? I just hit 50 followers...perhaps it's time for my first giveaway? And maybe I'll include one of these babies in there?? i've always been a huge fan of bed head, great finds! I've never really used Bed Head before now, but I'm beginning to branch out and use their other products and I'm totally loving the brand! Oh the scrub pad is totally awesome!!!! It's nice and gentle but really cleans your face.